Now-a-days, social media is an integral part of any business model. Owing to the huge number of users on social media, businesses have a fair chance of finding prospects and build on their goodwill with their active presence on social media. A study says that, 33% of marketers identified social media as a cost-effective marketing channel with medium to high ratings in comparison to display advertising and public relations. Users on social media love engaging and visually attractive yet effective content. A detailed and descriptive information is good, but a crisp and concise visual content is always more appealing and eye-catching. Infographic is one such tool, which is used to compile the information into one single image. According to a survey, publishers who use infographic as their marketing weapon can increase their traffic by 12%. Infographic is an innovative, pictorial depiction of the content, which is graphically created to grab the attention of the reader and make content easily interpretable. Since, infographic is a combination of both text and images, it makes the content more lively and engaging. You can use images, colours, textures, graphs, texts, icons, pointers, bullets and much more to illustrate the message. Designing the right infographic is an important and emerging strategy for social media marketing. Infographs can be used to display a wide variety of content, almost anything you can think of. This is like a snapshot of the entire content. This helps to highlight the main points and can be done with relevant images and minimum text. You can bring out some old information and present it in the form of an infographic to point out few important things. In modern times, infographs are the best way to present facts, results or numerical data and percentages. It can be used for industrial facts, Company statistics, survey results and much more. Infographs can also be used to list out action items, checklists or bulleted pointers. Other than the main content, sometimes it can also be used to put supporting materials in one place. Check out some of the best Infographics of 2015 here, according to Hubspot. How Infographic helps in social media marketing? Online users stop at something catchy, while browsing through so much of information on the web. Infographs can be really helpful to project required information and take them to the right audience effectively in this huge universe of information. Since, infographs can be used to collate Company information, including logo, contact info and others in one single place, it helps to increase the traffic to your social media pages. It is an effective way to build on brand awareness by increasing brand accessibility. Infographs can easily go viral and the information can be shared easily over social media as it is an image, rather than a big flow of content. Since, these are visually attractive, the rate of sharing increases. According to the information compiled by MDG Advertising, materials with compelling images or graphics can generate 94% more views than simple text. It also mentions that press releases can generate up to 14% increase in page views if the article published contains a photograph. 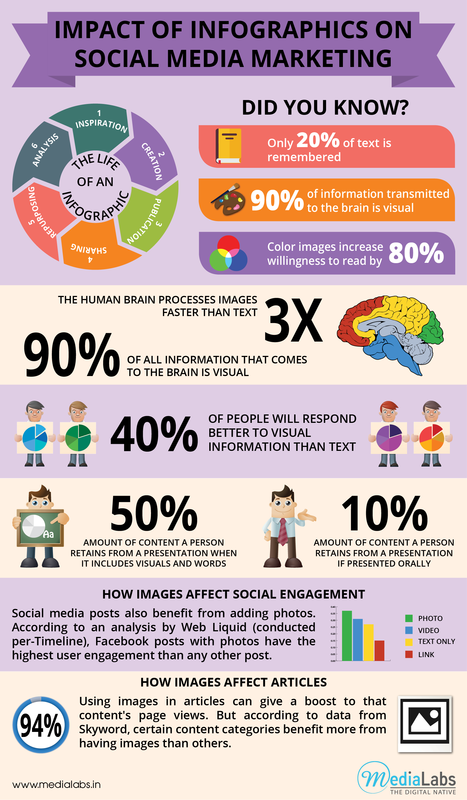 Infographs can be used to increase likes, comments and shares, thus affecting the number of followers in social media. These are also a medium for interactive engagement of online users. A HubSpot research indicates up to 37% increase in targeted customer engagement can happen if a post includes visual elements like photos, graphics and particularly, Infographs. As mentioned earlier, infographs are easy to understand and member. It highlights important points, which are the main takeaways for an audience rather than the entire things. Hence, information, mostly numerical facts are best emphasized using infographic. Infographs are primarily images, hence they are portable and can be easily embedded. They can be printed or used effectively in any other tool of marketing campaigns. Studies have shown an increase in leads, online views and webinar participation, after applying good infographic in social media marketing. When you see something and understand it easily, it stays in your mind longer, than long texts, which you tend to memorize. So, if you want to send across a crisp and clear message to the audience, you will choose to summarize your content in the form of an Infographic. If you consider social media marketing as one of your strategies for business growth and customer engagement, then it is important to equip your social media and design team with infographic expertise. Infographs can increase the impact of your online content and help you to enhance your brand value.